Over ten years ago, I set up a hand-me-down sewing machine on a cardboard box with a dream to start my own clothing line. I often worked 7 days a week, sometimes up to 18 hours a day. I taught myself bookkeeping and accounting, marketing, networking, taxes, and all of the other important elements that go into owning your own company. I'll admit that at the time, I had absolutely no idea how much was involved or how much work it would be. But I was determined to make Mountains of the Moon a reality. A lot has changed since those days, in good ways as well as challenging. Technology now allows us to reach a much wider audience (there was no "social networking" back then! ), and small business owners are able to DIY a lot of the things we once had to outsource. On the other hand, the economy has changed too. There are also a lot more big box stores who are able to sell mass-produced merchandise made overseas for very cheap. One thing that hasn't changed for me since I started my company is the determination to succeed in a career doing what I love. When Mountains of the Moon first started to experience steady growth, I was certain that in just a few years I'd be working much less and rolling in the dough. Ha! I'm very grateful that I've been able to sustain myself, and for all I've learned along the way. But like all small business owners, I still have to work very, very hard. I'm much more careful now to give myself a little time off to recharge, but I definitely continue to work long hours, almost everyday. And I am definitely not rolling in the dough! Maybe you are a small business owner too, and what you just read sounds very familiar. Or maybe you work for a small business. Or maybe you make the effort to support small businesses. Whatever your role may be, if you're an advocate on any level of the small business movement, you are awesome. Period. I think I speak on behalf of a lot of independent designers, artists, and companies when I say that we are so grateful for you. Without you, we wouldn't exist. 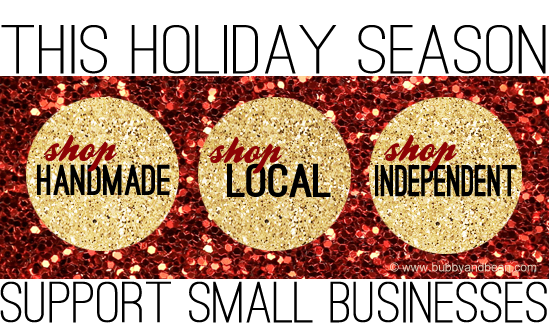 The holiday season is probably the absolute best time of the year for all of us to show our small business support. When we shop handmade and local, we not only get to give unique gifts made with love, we're also encouraging growth of the economy - small businesses return more of each dollar into the local economy and provide more new jobs than large chain stores. We're also often getting higher quality products and better customer service when we choose to shop at smaller companies. We're helping out the earth too - small and local companies create much less waste and use many less fossil fuels by choosing not to produce merchandise overseas. And best of all, when we shop small businesses, we are supporting creativity, fostering community, and encouraging talent, which truly does make our world a more beautiful place. If you've gotten this far, I hope you'll join me in supporting small businesses for the holidays and encouraging others to do the same. I've designed these banners and buttons (above and below) to spread the word about the importance of shopping handmade, local, and indie. Please feel free to use them on your websites, blogs, facebook pages, etc. Just right click on an image to copy and paste, or copy the code below it to insert into your html. (A link back to www.bubbyandbean.com or this post is appreciated, but not required). And then be sure to leave a comment on this post with the link to your blog, website or page that is displaying the banner/button so others can visit you! I hope you like the banners, and thank you again for supporting small businesses everywhere! Speaking of supporting small business, I hope you'll take a minute to check out our wonderful new and returning sponsors for the month of December! 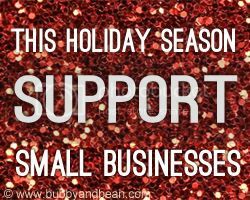 It is sponsors that allow Bubby and Bean to grow, and this group of shops and blogs all have some pretty amazing stuff to offer for the holidays. To see for yourself, click on their pretty ads in the right side bar. (If you're viewing this in a reader, just click here). melissa, i always admire all you have done, continuing doing, & what you stand for, wholeheartedly! These are sooooo pretty and what an important statement!!! I am for sure shopping small businesses this year and am going to make sure my friends see these buttons. Thank you!! Amazing Idea....Love it Im putting this banner on my blog too. 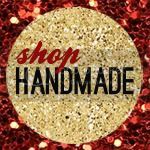 I have a small shop where I sell my handmade jewellery and decoupage stuff. It would be nice if you all would check it out and it would mean a lot if you would even like the page! I grabbed a button. Thanks! Hey hey! I saw the Intuit commercial on TV and since my cousin is starting a gentlemen's spa, I decided to check out what Intuit offers. On their site, I saw your little Quickbooks story and out of sheer curiosity, I came to check out your stuff. I must say, I'm impressed! I try to support small businsses when I can so I'm glad to see you're doing your thing here. Way to go! Keep it up! Yaaaaay for small biz! :) Your banners are so pretty. I don't have a website but I will post on my facebook account. Respect for that post, Melissa. Not many people realize the difference between buying from big chains and small businesses. I just found your blog and I am so glad that I did! I adore this post so much! I'm a new follower and I can't wait to read more! I just added a banner on my site! This is a great message and I am putting a button on my blog for the season. It's a beautiful button linked to a great post, hope it sparks some small business shopping! I just have to say thank you again to all of you amazing people showing your small business support! I've been seeing these banners on awesome blogs and websites all over the Internet and it makes me very happy :). Go small business!! !